Big news! I’ll be taking a senior level position at the Qatar Foundation to work on the next generation of humanitarian technology solutions. I’ll be based at the Foundation’s Computing Research Institute (QCRI) and be working alongside some truly amazing minds defining the cutting edge of social and scientific computing, computational linguistics, big data, etc. My role at QCRI will be to leverage the expertise within the Institute, the region and beyond to drive technology solutions for humanitarian and social impact globally—think of it as Computing for Good backed by some serious resources. I’ll spend just part of the time in Doha. The rest of my time will be based wherever necessary to have the greatest impact. Needless to say, I’m excited! My mission over the past five years has been to catalyze strategic linkages between the technology and humanitarian space to promote both innovation and change, so this new adventure feels like the perfect next chapter in this exciting adventure. I’ve had the good fortune and distinct honor of working with some truly inspiring and knowledgeable colleagues who have helped me define and pursue my passions over the years. Needless to say, I’ve learned a great deal from these colleagues; knowledge, contacts and partnerships that I plan to fully leverage at the Qatar Foundation. It really has been an amazing five years. I joined the Harvard Humanitarian Initiative (HHI) in 2007 to co-found and co-direct the Program on Crisis Mapping and Early Warning. The purpose of the program was to assess how new technologies were changing the humanitarian space and how these could be deliberately leveraged to yield more significant impact. As part of my time at HHI, I consulted on a number of cutting-edge projects including the UNDP’s Crisis and Risk Mapping Analysis (CRMA) Program in the Sudan. I also leveraged this iRevolution blog extensively to share my findings and learnings with both the humanitarian and technology communities. In addition, I co-authored the UN Foundation & Vodafone Foundation Report on “New Technologies in Emergen-cies and Conflicts” (PDF). Towards the end of HHI’s program in 2009, I co-launched the Humanitarian Technology Network, CrisisMappers, and have co-organized and curated each International Conference of Crisis Mappers (ICCM) since then. The Network now includes close to 4,000 members based in some 200 countries around the world. Last year, ICCM 2011 brought together more than 400 participants to Geneva, Switzerland to explore and define the cutting edge of humanitarian technology. This year, ICCM 2012 is being hosted by the World Bank and will no doubt draw an even greater number of experts from the humanitarian & technology space. I joined Ushahidi as Director of Crisis Mapping shortly after launching the Crisis Mappers Network. 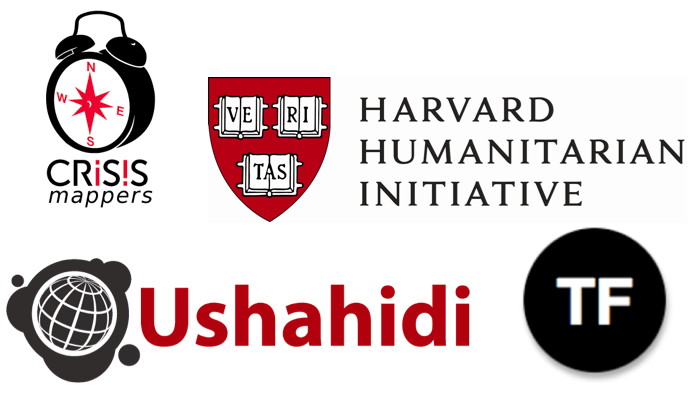 My goal was to better understand the field of crisis mapping from the perspective of a technology company and to engage directly with international humanitarian, human rights and media organizations so they too could better understand how to leverage the technologies in the Ushahidi ecosystem. There, I spearheaded several defining crisis mapping projects including Haiti, Libya, Somalia and Syria in partnership with key humanitarian, human rights and media organizations. I also spoke at many high-profile conferences to share many of the lessons learned and best practices resulting from these projects. I am very grateful to these conference organizers for giving me the stage at so many important events, thank you very much. And of course, special thanks to the team at Ushahidi for the truly life-changing experience. Whilst at Ushahidi, I also completed my PhD during my pre-doctoral fellowship at Stanford and co-founded the award-winning Standby Volunteer Task Force (SBTF) to provide partner organizations with surge capacity for live mapping support. I co-created the SBTF’s Satellite Imagery Team to apply crowdsourcing and micro-tasking to satellite imagery analysis in support of humanitarian operations. I also explored a number of promising data mining solutions for social media analysis vis-a-vis crisis response. More recently, I co-launched the Digital Humanitarian Network (DHN) in partnership with a UN colleague. The words “co-founded,” “co-launched,” and “co-directed” appear throughout the above because all these initiatives are the direct result of major team-work, truly amazing partners and inspiring mentors. You all know who you are. Thank you very much for your guidance, expertise, friendship and for your camara-derie throughout. I look forward to collaborating with you even more once I get settled at the Qatar Foundation. To learn more about QCRI’s work thus far, I recommend watching the above presentation given by the Institute’s Director who has brought together an incredible team—professionals who all share his ambition and exciting vision. When we began to discuss my job description at the Foundation, I was simply told: “Think Big.” The Institute’s Advisory Board is also a source of excitement for me: Joichi Ito (MIT) and Rich deMillo (GeorgiaTech), to name a few. Naturally, the Qatar Foundation also has access to tremendous resources and an amazing set of partners from multiple sectors in Doha, the region and across the globe. In short, the opportunity for QCRI to become an important contributor to the humanitarian technology space is huge. I look forward to collaborating with many existing colleagues and partners to turn this exciting opportunity into reality and look forward to continuing this adventure with an amazing team of experts in Doha who are some of the best in their fields. More soon! This entry was posted in Humanitarian Technologies and tagged Foundation, Qatar, QCRI. Bookmark the permalink. Hi Patrick, as sad as I am to learn that you’ll be leaving us in DC, I’m really excited for you. It looks like you’ll have the opportunity to do some serious good – best of luck!!! Thanks Noel! I’m not leaving DC though, just spending part of the time in Doha. Thank you very much, Saleem! Perfect! A creative mind and the resources to see creative thought become a reality for good. Dearest Patrick, I am sad and excited in the same breath. You inspire me and I am honoured to have worked so closely with you at Ushahidi. Fortunately, we will still connect via Crisismappers, Standby Task Force and any other project you co-found or start that I can join (serial volunteer). You are a mapstar and will be able to affect much change at Qatar. I can’t wait to see it. Thank you for your leadership and for being so supportive of big ideas = change. Thanks Heather dear, you’re the bestest and I’m so thrilled we’ll continue working together on CrisisMappers & SBTF etc 🙂 Hugs! Congratulations on the big decision(s) man! Really can’t wait to see what follows. Thanks man, great to know you’re joining Ushahidi to continue the adventure there! sounds like an amazing opportunity! cognrats! that was supposed to say congrats, but obviously i was too excited and mistyped. Huge Congrats Patrick;) Really great meeting you a few weeks ago, and I’m sure I’ll see you very soon! Patrick – Mabruuk!! This is great news. Great for you and great for QF. Enjoy and inspire, as always dude!!! Patrick, Congratulations on joining Qatar Foundation. Wish you all the best in your future endeavours. Thank you very much, Ankit! Congratulations! Looking forward to big things. Thanks Chief! Congrats to you on graduating from Berkeley’s iSchool!! Great Patrick! Hats off! Mabrouk (get used to that kind of greetings from now on…)Well done! minds like you are needed in those organizations at senior level.. keep on doing what you are doing with QF power and results will keep on shining as always! Oh! …you’ll be getting free tickets to see the Barcelona FC matches in Spain? :)Let me know i might join you rod a drink or two! Congratulations! I look forward to seeing the results of “think big” initiative! Hope to see you back in San Francisco on regular basis. Best of luck! Congratulations, Patrick! Good Luck in your new endeavor. Hello Patrick. I woul like some advice in time to prepare for Doha conference. Would you be so kind as to email me at the above address. Regarding environmentsl innovation in extractive industry. Thank you.